First up was the brand new Two Birds Pale Ale, which is replacing the very nice Bantam in their core range. I was really impressed with the beer, something I don't always say about offerings from Two Birds. It's brewed with oats and has the silkiness you'd expect from that, while the hops are quite forward and provide plenty of pine and passionfruit. I'll be interested to see what this tastes like when it's not super fresh, as the pungent hops really made it for me. Riding Steady (Level 30) is why you're reading about it now. I wrote in "The Biggest Untappd Catchup Ever!" about the impressive beers that we've recently received from Ægir Bryggeri from Norway, another of their beers - Lærdøl Sour Cherry Rye - unlocked Here Come the Vikings (Level 6). All the elements mentioned in the title were present; there was pleasant lactic tartness, nice cherry flavour and just a hint of the spiciness that characterizes rye in beer. It's a beer I really enjoyed! Old Wives Ales Pop's Passion Tart, a beer that debuted as a keg only Berliner Weiss for their first birthday, has been re-imagined as a Gose using smoked salt! It's still got nice refreshing qualities and passionfruit, but what has really taken it to the next level is the salinity with this faint smokiness making it stand out from the crowd. It's a really interesting beer, perhaps more a baby Lichtenhainer than a Gose? Just like when I checked in the Berliner Weiss two badges were unlocked; What Gose Round (Level 6) & New Brew Thursday (Level 30). Dogfish Head are one of the foremost producers of IPA's in the world. Their beers don't make it to Australia with great regularity and so, when fresh, I always pick them up when I see them. This time happened to coincide with the release of their Continually Hopped IPA badges. The first of which (60 Minute) was unlocked by their 60 Minute IPA. This was as fresh as I can recall having this beer, with grapefruit and pine exuding from the hops. The second and final of the two Continually Hopped IPA badges was the (90 Minute). No prizes for guessing that the beer that unlocked this badge was Dogfish Head's 90 Minute IPA. This is a really big, sweet Imperial IPA. The hops are quite bitter and provides masses of pine resin as well as notes of tropical fruits and herbal qualities. I'm really glad these badges came along as I've quite enjoyed sampling these again! Yeastie Boys Bigmouth unlocked Mardi Gras (2017), the annual badge Untappd releases to commemorate Mardi Gras. This badge is unlocked by simply having a beer during set dates around the annual gay community celebration. I will write more about this beer in the Carwyn Beer-Thusiast Pack review, which should be up any day now. All I'll say for now is that it's new and dangerously drinkable! I won tickets to the Melbourne BeerFest through the Crafty Cabal. I decided beforehand that I'd use the day to mostly taste beers from brewers I was less familiar with. The first beer I had unlocked Riding Steady (Level 31). 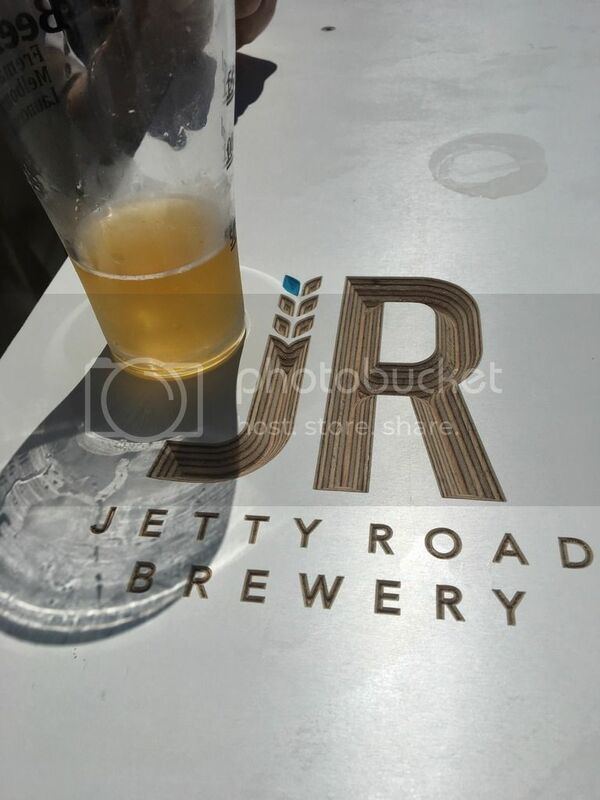 That beer was the Pale Ale from brand new brewery Jetty Road, which will be based out of Dromana once council issues are resolved. At the moment they are producing this very tasty, quite bitter Pale Ale at Kaiju. A few hours and many many beers later, the next iteration of the Riding Steady badge (Level 32) rolled around. The beer was from Little Rivers, a Tasmanian brewery that I didn't know much about. The beer that unlocked the badge was their Hefeweizen; a beer that was true to the style with plenty of banana and clove characteristics. Apparently I'd had this beer before, at The Gertrude during GBW 2014..., but have no recollection of this at all. My final beer at the Melbourne BeerFest unlocked 2X (Level 14). Sauce Brewing are a Sydney brewery that launched in November last year. Their beers have started appearing around Melbourne in the last week or so, in pretty striking cans. Naturally because it was the end of a big days drinking I thought it best to try their biggest beer; Mega-Hop Sauce - an Imperial IPA. It had lots of sweet malts, with caramel taking centre stage, whilst the hops were mostly citrusy and provided lovely bitterness. I don't know what to think about the beers from Sailor's Grave; some of them are excellent and some are very mediocre. Thankfully the Grapefruit and Marigold Saison, which unlocked Trip to the Farm (Level 21), was one of the excellent ones! A lovely yeastiness (apparently they use the original DuPont yeast) combines with bitter grapefruit flavours as well as a strong floral aroma, with elements that carry over to the taste. I think this is my favourite beer from these guys so far! One of the most anticipated beer releases of the year so far was Balter's new Pilsner. I was expecting this to be a straight up and down interpretation of the style, as Balter have done with their first two packaged releases. That's exactly what I got, with a lovely light maltiness being complimented by grassy and floral hops. The beer finishes nice and crisp with enough bitterness for the style. Riding Steady (Level 33) is why you're reading about this beer now. Last but not least for this Untappd Catchup is the new(ish) Voodoo Ranger from New Belgium Brewing Company. Apparently, despite it being based in Colorado, this beer qualifies to unlock "NC (North Carolina) Beer Month is Coming! (2017)" - to unlock this simply check-in to any beer from any brewery on this list. I really enjoyed the clean bitterness of this IPA, which was driven by tropical fruit notes but also had nice biscuity malts.